It’s 5:30pm, and the kids are in front of the TV singing along to Frozen at the top of their lungs for the fifth time this week. But after your last family outing to the Indian restaurant down the road, you’re scared to even order takeaway from them anymore. That flying papadum will not be forgotten. Instead of facing a nightmare cleanup job in the kitchen (and the dining room, the lounge room and the kids themselves – how do they get food in their ears anyway? 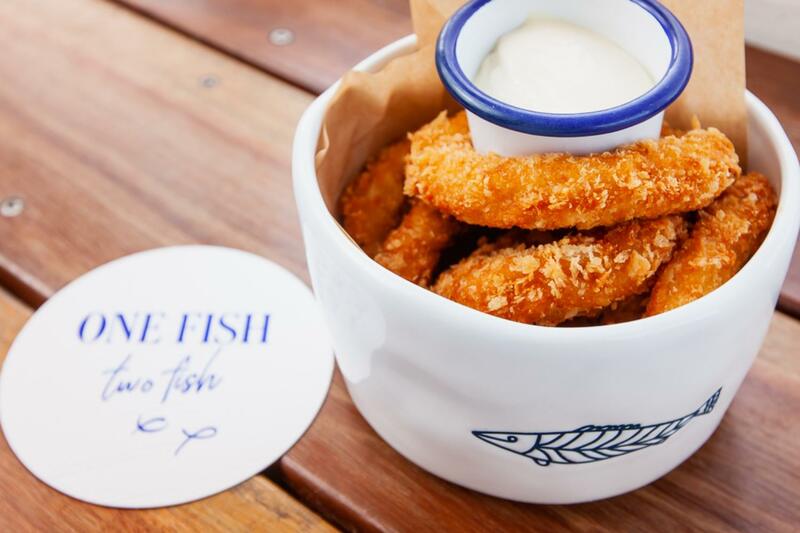 ), take the whole family out to a spot where the kids menu involves more than just fish and chips, there’s entertainment that doesn’t involve throwing food, and you won’t have to settle for a bad chicken parma. The bad memory of your last dinner adventure? Let it go. Here’s a deal that’ll reel the ankle biters in – the Mumdays special at One Fish Two Fish is a solace for adults and a Dr. Seuss heaven for kids! Every Monday from 12pm – 2pm, the little ones can scribble on the One Fish Two Fish puzzles and colouring pads while munching on a dedicated $5 kids meal while you enjoy a lunch meal and beverage for just $20. If you’re pining after classic chicken schnitzel, then head over to the Pineapple Hotel and don’t be afraid to bring your kids too! With a playground on site and a kids menu to boot, this laid-back restaurant will keep the little people entertained while you sneakily help yourself to dessert without having to share. And even better, kids eat free on Wednesdays and Fridays. Next time your tyke starts a tanty, instead of going tut-tut, why not putt putt? That’s right, Victoria Park Bistro is perfect place to gain respite by indulging in their crunchy wood-fire pizzas, rotisserie kitchen chicken, or breakfast waffles, while your child plays miniature golf, scales the playground, or indulges themselves in kiddie breakfasts that are so good, they won’t be asking for any of yours! Take the kids for a train ride adventure to the city, settle them in a booth at Jamie’s and let them choose their dinner from the viewmaster kids menu. They’ll have as much fun ordering as they will eating, with chicken lollipops, a five-a-day picnic box, and mini spaghetti and meatballs on offer. Then, before they start asking ‘can I have some of your dinner?’ put a colouring pad in front of them and finish off your focaccia bread board and primavera ravioli. Was that a sugar plum fairy little Jenny just saw!? Nope, it’s just the lovely staff at Plum Tucker whose delicious breakfast and lunch meals are simply magical. Watch your children become captivated with the dazzling menu, which includes toffee apple waffles and toasties galore. Toddlers and babes can also enjoy Plum Tucker’s kids room in the upstairs section of the café! This little-known restaurant serves up appetisingly authentic Italian fare and is a family-friendly environment too! As well as the usual kids menu (which includes a free soft drink with any meal! ), they also cater to those fussy eaters out there as well who prefer their pizza bases gluten-free! If worse comes to worse, and your cherub refuses to leave the nursery, they do take-away as well! Turn off Peppa Pig and get out the car seat. It’s dinner time.